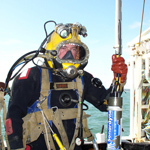 There are a number of methods that can be used for surveying sites on the foreshore or underwater. 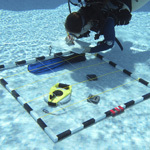 The techniques vary in accuracy, complexity and cost so not all techniques are applicable for all survey tasks. It is essential to study the site before starting any further survey work and generating a sketch is a good way to do this. Since the arrival of small and low-cost Global Positioning System (GPS) receivers it has been easy to find out where you are in the world. Fitted into hand-held instruments and mobile phones they are readily available for use in site survey work. 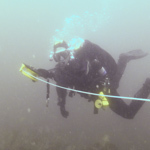 For a radial survey a diver records the position of features on a site using a distance and bearing back to a single control point. This technique is very simple, quick and can be done by a single diver. The technique is not accurate enough for pre-disturbance or excavation surveys but gives a good enough idea of the site for an assessment. Offsets and ties are used to position features relative to a baseline running through the site. An offset measurement positions a feature using a single measured distance at right angles to the baseline from a known point, a tie uses two or more measurements from known points on the baseline to position the feature. Three-dimensional (3D) trilateration or Direct Survey Method (DSM) uses distance and depth measurements to position features on a site. The technique is similar to 2D trilateration with the exception that distances are measured directly to features and the processing deals with any difference in depth. Drawing frames are used to record very small areas of the site in detail. 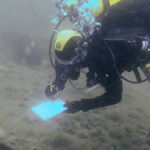 A frame is placed over the area to be recorded and the diver draws visible features on a scale drawing or directly on to the drawing frame. If a series of overlapping photographs are taken of a site then they can be joined together to form a single large photograph. 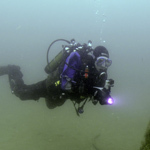 The photographs can be of the seabed taken vertically downwards or of the side of a structure. Since the tools to do this have become more widely available this technique is being used more often. Sufficiently good results can be obtained with a digital camera and the graphics processing software available found on most computers. Like close-range photogrammetry and drawing frames, this technique is effective for small areas but must be used in conjunction with a control point network. 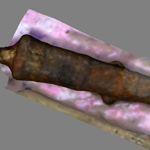 Close-range three-dimensional photogrammetry is a very accurate way of recording complex structures. A number of photographs are taken of the structure from different viewpoints and processed in a computer program. The program then constructs a three-dimensional model of the structure to scale. Acoustic positioning systems are widely used for survey and subsea positioning in the offshore industry. Using the same principles as 3D trilateration, these systems replace tape measures with distances measured with sound pulses. 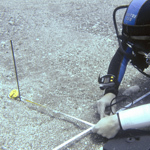 A diver fitted with suitable hardware can be positioned within an array of acoustic beacons, on the surface the archaeologists can then see where the diver is.